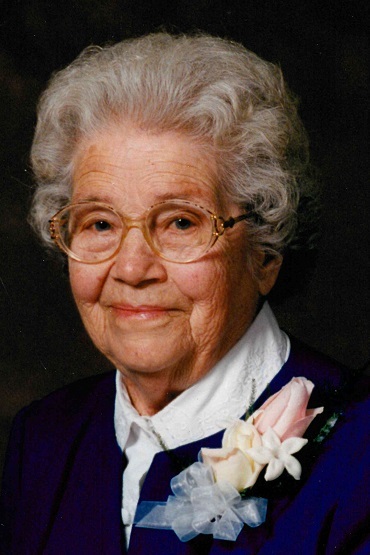 Gertrude M. Rogier, 102, passed away on September 1, 2018. She was a native of Uniontown, Indiana and was born on January 26, 1916. Gertrude Maria was the daughter of Chrysostom “C.H.” and Anna (Schlachter) Gehlhausen. Gertrude was united in marriage to Fred Rogier in 1937 at St. Martin Catholic Church in Siberia. He passed away in 1994, after 57 years of marriage. Also preceding her in death were her sons, Leon Joseph Rogier in infancy and Ron Rogier in 2002; a great granddaughter, Amber Nicole Rogier in 1999; son-in-law, Paul Luecke in 2012; sisters, Theresia Taylor, Agnes Shively, Hilda Hoffman and Rita Gulledge and brothers, Leo, Albert, Anthony, Lawrence and Rudolph Gehlhausen and twins, Edward and Urban in infancy. She was a homemaker, loved gardening, flowers and being with her children, grandchildren and great grandchildren. Surviving are her sons, Marvin Rogier (Norma Jean), Tell City, Carlton Rogier, Tell City, Dennis Rogier (Linda), Rockport; daughters, Charlene Wheatley (Joe) Richland, Mary Luecke, Evanston and Carolyn Gehlhausen (Donnie), Chrisney; grandchildren, Greg Rogier, Marty Rogier, Steve Rogier, Angela Wheatley, Julie Lawrence, Cheryl Waninger, , Tricia Buckman, Jason Wheatley, Vince Luecke, Patrick Luecke, Chad Luecke, Tim Luecke, Teresa Dilger, Laura Ayer, Melissa Walls and Nicole Risse; 34 great grandchildren; two great-great grandchildren; sister in law, Eileen Gehlhausen, Bristow and daughter in law, Pat Rogier, Owensboro, Kentucky. A Mass of Christian Burial will be held at 10:00 AM on Wednesday, September 5, 2018, at St. Augustine Catholic Church with burial in St. Augustine Cemetery. Rev. Brian Esarey will officiate. Visitation will be from 2:00 until 7:00 PM on Tuesday and from 8:00 until 9:15 AM on Wednesday at Huber Funeral Home, Tell City Chapel.